Big speaker manufacturers know one thing: a dollar spent in marketing beats two spent in R&D. Granted, the quality of speakers these days is surprisingly high, this is the 21st century after all. However, to a greater or lesser degree, all this marketing hype and those mass-market production techniques end up compromising sound quality - to the point where you end up wanting that little bit more. Entry level speakers all sound very "Hi-Fi", but often lack a sense of musicality, and frequently lack that underlying sense of realism. The more you spend, the better it gets, and that is kind of the whole point for them. On the other hand you're no better off with your average small manufacturer. A passion for good sound is commendable, but do they really have the expertise and experience to offer you value? DIY can provide excellent sonic value if you have vast amounts of spare time. Kits can provide the best or worst of all this depending on how you look at it. ADX 22W+22W class-D amp. Sony car Discman. 4iW speakers. This also sounded very good. A pattern is emerging here. Demonstrations are more challenging without a distribution chain, but this can easily turn into a real advantage. Speakers really need to be auditioned. The best way to try speakers at your own pace, in your own space, is to arrange to get some "on appro". You pay us as usual, but there's no obligation (or expectation) to purchase. No need to think up explanations or feel misplaced guilt over "returning" something you only ever wanted to try in the first place! Of course, if you buy our speakers outright, you can use our money back guarantee if you aren't happy. We also may have demo units available which we can send out for you to try, and in some cases buy. 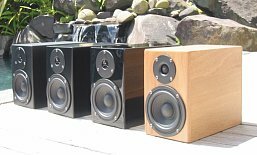 There are 4iW speakers installed in a number of locations around the New Zealand, and demonstrations can be arranged in Christchurch. So whatever your level of interest, please drop us a line (email sales@adx.co.nz). If you think your favourite stereo shop should have our speakers, ask them to contact us! Online sales are available, please see ADX sales info and/or browse and order using the web shop. All our speakers come with a lifetime warranty on our workmanship, and a 5 year warranty on parts. We can offer this because we manufacture the products ourselves - we should have full control over our processes, and a good deal of control over the parts we use. If we couldn't confidently stand by the quality of our work, it would have to raise questions. Quality is our responsibility, and your right. We keep our repair costs low. We are in the business of profiting from your delight, not your despair. Burnt out voice coils are easily identified - but there are a multitude of situations which can lead to this. In many cases we are happy to replace the drivers for free and provide information to help ensure it doesn't keep happening. If you want to modify or repair the speakers, this won't automatically invalidate our warranty, but obviously we can't cover workmanship that isn't ours. If you acquire our speakers second hand, our warranty remains, but their uncertain heritage can cloud the issue of where our responsibility ends. To honour a warranty claim we generally need the faulty product or parts returned to us for diagnosis, and to guard against abuse of the system. Ultimately, warranties are provided at our discretion. Copyright &COPY; ADX Electronics / ADX Electronics Limited 2001-2008. All rights reserved.